The history of long distance communication is a fascinating, and huge, subject. I'm going to focus just on the history of network email — otherwise I'm going to get distracted by AUTODIN and semaphore and facsimile and all sorts of other telegraphy. Electronic messaging between users on the same timesharing computer was developed fairly soon after time-sharing computer systems were available, beginning around 1965 — including both instant messaging and mail. I'm interested in network mail, though, so we need to skip forward a few years. Around 1968 the initial plans for "ARPANET", a network to link the various ARPA-funded computers together were underway. Local mail between users on the same system was already a significant part of the nascent community. A. The thing that really struck me about this evolution was how these three systems caused communities to get built. People who didn't know one another previously would now find themselves using the same system. Because the systems allowed you to share files, you could find that so-and-so was interested in such-and-such and he had some data about it. You could contact him by e-mail and, lo and behold, you would have a whole new relationship. Q. Were these first communities built around mailing lists? It wasn't a static medium. It was a dynamic medium. And that gave it a lot of power. Q. It was all about community? I said, oh, man, it's obvious what to do: If you have these three terminals, there ought to be one terminal that goes anywhere you want to go where you have interactive computing. That idea is the ARPAnet. J.C.R. Licklider mentioned inter-computer mail to me in a conversation about 1968, when he asked me if I was interested in a project he had in mind, "to connect all the ARPA-funded machines together, and see what they said to each other." He was recruiting folks for what became the Project MAC networking group. By that time, many time-sharing systems had some kind of internal mail. 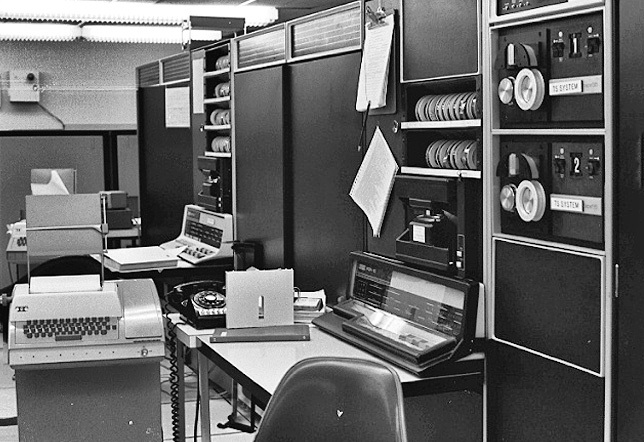 Discussion of linking the mail systems on various computers was one of the earliest applications proposed for the ARPANet. The "@" sign was a character not used in names, and wasn't really used for anything on TENEX, so Ray chose to use it as a separator between the user and host. It's a happy accident that BBN used TENEX systems; if they'd had the other type of system used on ARPANET, Multics, the "@" key would have already had a reserved use — deleting the current line — and we might not have seen it used for email. To make network mail work between different machines, you need a way to transfer the message that's a bit more portable than CPYNET. File Transfer Protocol (FTP) was being developed as a standard way of copying files from one machine to another. At one of the FTP development meetings, someone proposed sending mail via FTP. Someone from BBN mentioned that Ray had done something similar, using user@host addresses. A standard for email transfer began to be born. SNDMSG already used "business memo" style messages — To:, From:, Subject:, Cc:, Date: etc. — so the messages it sent looked like modern email in many respects; that format was adopted, and began to be standardized. John Vittal combined and extended existing tools to create MSG, adding several new features including "Answer" — a command to automatically create a message formatted as a reply to the current one. MSG was the first integrated modern email client. It included a command for replying to a message, similar to what is used today. My impression at the time was that, as soon as this command became widely available, e-mail use exploded. As one of MSG's early users, I found that it permitted quick, convenient, and sustained conversations similar to the conversations we have come to expect over e-mail today. Ray Tomlinson sent the first mail over the network, and used the "@" sign. Dave Crocker developed the standard format for mail (and continues to develop new standards). They were both honored by the IEEE "for their key roles in the conceptualization, first implementation and standardization of networked email”. But email wasn't invented by a single person, or by two people, or three. There was no single unknown genius who created it, or even a significant fraction of it, despite what recent PR campaigns may have tried to convince you of. Take a look at the authors of the early email RFCs, or the names in some of the articles I relied on today, and you'll see some of the people who created email. By Steve Atkins, Founding partner of anti-spam consultancy & software firm Word to the Wise. Visit the blog maintained by Steve Atkins here.